Leader of Naga People’s Front (NPF) Legislature Party TR Zeliang slammed the People’s Democratic Alliance (PDA) government in Nagaland for bringing “change only through words and not deeds”. 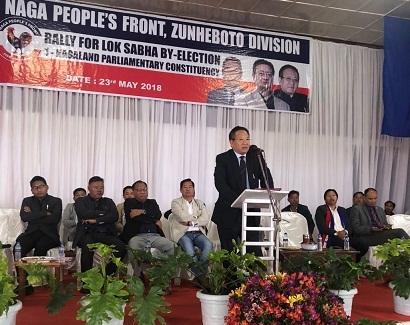 Addressing a public rally in Zunheboto town on Wednesday, Zeliang recalled the issue of Students Insurance Scheme which he had raised during the first session of the 13th Nagaland Assembly. He said he is yet to receive a reply from the ruling government and sought to know whether the insurance scheme was a centrally sponsored scheme or a state-funded scheme. “How are they going to implement it,” he wondered. He further asked whether the said scheme had “any linkage with third party companies” and whether it was “free for all or certain premium” was to be paid by the beneficiaries. “However, now that Rio is in power, G Kaito Aye is being sidelined and preference is given to the newly elected members in the Cabinet,” he further alleged. While calling upon the Sumi community to be vigilant against the “evil designs of Rio” lest more capable Sumi leaders are sacrificed at the altar of his political game for power and wealth, Zeliang highlighted sanctions approved for Zunheboto under the previous NPF regime which was diverted by PDA government recently. Kaito belongs to Sumi community. He said Rs 2.75 crore which was sanctioned for the development of Zunheboto town has now been diverted, leaving zero penny for the town. He also stated that during the first session of the 13th Nagaland Assembly, the figures were wrongly mentioned by Governor PB Acharya while addressing the House. Zeliang said he took up the matter for debate in the budget session and as the leader of Opposition he brought it to the notice of Speaker Vikho-o Yhoshü in writing asking for the reconciled figure from RBI. “Unfortunate as it is, there has been no reply from the Speaker till date,” he added. On the performance of two-month-old PDA government, NPF spokesperson Achumbemo Kikon cited the unfortunate incidents of attempts on the lives of two business persons in Dimapur just few weeks after Rio took over as the Chief Minister, the closure of petrol pumps in Nagaland in protest against the kidnapping of a driver and handyman and the boycott of by-election by the college students community. On the difference between NPF-BJP alliance and NDPP-BJP alliance, Kikon said NPF was never controlled by BJP whereas PDA government today is controlled by BJP. The NDPP is playing second fiddle to a “de-facto BJP government”, he added.